With a nod to Puss in Boots, Gail Carson Levine has written another brilliant tale of fairytale proportions. 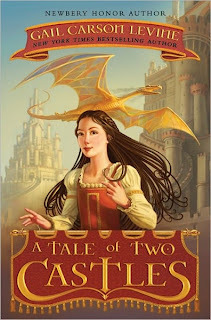 Elodie has traveled far from her home island in order to become an apprentice in the city with two castles (the king’s castle and the ogre’s castle). However, due to a new law Elodie cannot in fact become an apprentice without paying the master. And seeing how Elodie only had enough money for her passage and a copper (which a cat with white boot-like markings stole on her first day there) she is in danger of starving. Then enters the dragon named Meenore, who tends to be more of a detective who happens to roast bits of bread and cheese when not detecting. Meenore proposes that Elodie become ITs (dragons are neither he or she) apprentice. Elodie also becomes friends with Count Jonty Um, the shape shifting ogre that the rest of the town can’t stand. With Count Jonty Um’s life in danger, a betrothal of the princess, and a cat who seems to be able to be more than a cat, can Elodie help Meenore figure out what is going on without getting in trouble herself? This is a great book full of magic and mystery and just a whole lot of enchanted fun. It doesn’t really take on the perspective of those closest to the Puss in Boots characters, but it is interesting to see how that puss and it’s master figures out how to swindle a town. In fact, I like how I question what is going to happen (even thought I know the Puss in Boots story) due to the fact that I am seeing it all happen from afar–like most of the people in the story would. But it is even better to see how Elodie helps to save the town and herself by using her brain rather than magic or luck. In fact, I really like Elodie. She cares about both of her parents and her friend. She tries to be good while trying to understand a city that isn’t. She is careful, thoughtful, and intelligent. She gives people the benefit of the doubt. I would totally want her for my friend if I ever visited Two Castles! Count Jonty Um makes almost everyone nervous because he can shape shift. Why would this bother people? Why isn’t Elodie afraid of the ogre? Why did the acting troupe decide to perform so many pieces with beasts in them? Was there an underlying message in their play selections? Do you believe that the princess and Master Thiel were working together? Why or why not? This book has portions that were based on the story Puss in Boots. Compare the original fairy tale with this story. What is the same? What is different? Discuss appearance verses character. What is Elodie’s appearance verses her character? Meenore? Count Jonty Um? The rest of the people in Two Castles? May 24, 2012 in book review, elementary school, fantasy, middle school.